Gluten Free Pumpkin Butter Cake | Great gluten free recipes for every occasion. Gluten free pumpkin butter cake is a light, buttery, almost flaky vanilla cake that bakes all along the bottom of the pan and up the sides. And it’s filled with the nicest, lightest most lightly sweet pumpkin cheesecake you’ve ever had. Other than apple pie and pumpkin pie, I wouldn’t say that it’s so obvious what to serve for dessert on Thanksgiving. I mean, everyone knows about turkey, gravy, stuffing, green bean casserole, and definitely some lovely dinner rolls, but after that it’s not such a slam dunk. First of all, everyone is stuffed from the meal. Even when you have a family like mine that absolutely plans ahead that they’re going to overeat on Thanksgiving, there are limits. And of course there’s always the matter of what, exactly, to serve. 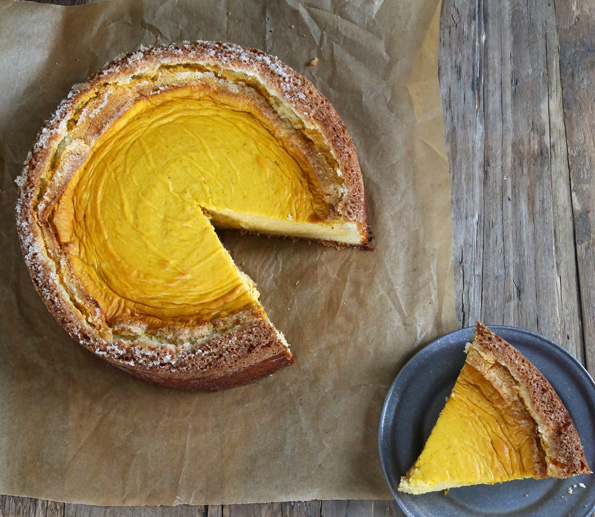 You definitely want something with pumpkin on the dessert table. It’s a must. 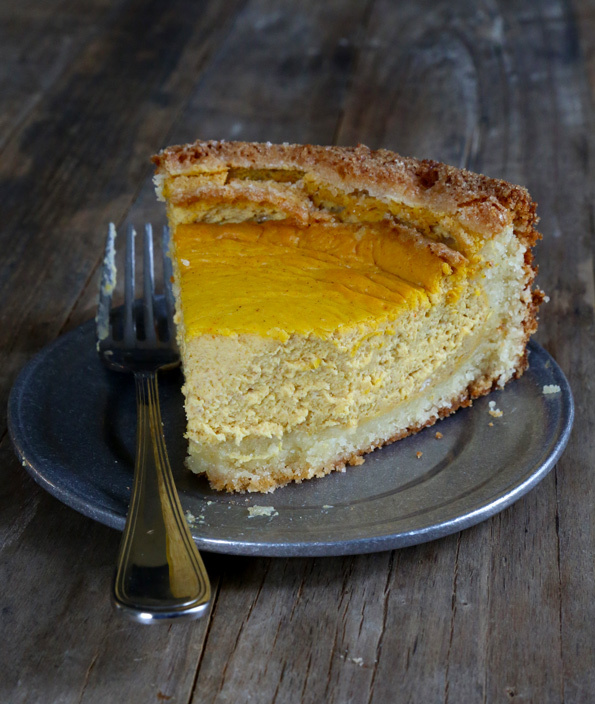 But pumpkin pie isn’t necessarily everyone’s favorite (what? it isn’t! Is it?). And since a proper apple pie isn’t overly sweet at all, it’s nice to have a pumpkin dessert option to match. All of this is to say that I believe I’ve found essentially the perfect pumpkin dessert for Thanksgiving: gluten free pumpkin butter cake. It’s the crust that’ll knock your socks off, really. Okay and the pumpkin cheesecake filling doesn’t hurt either. It slices nice and clean, but it’s still light and fluffy. As you can see, to get that beautiful sugary crust all around your butter cake, a springform pan really works best. Generally I try to avoid springform pans, but for any sort of cheesecake, it really is best to use one. You could also try baking this in separate pans like our original California Pizza Kitchen-Style Gluten Free Butter Cake (just reduce the baking time), as it’s easier to get a small cake cleanly out of a baking ramekin than it would be to get a whole 9-inch cake out of a baking pan without inverting it. This cake also keeps really beautifully in the refrigerator for up to 2 days, so it’s a great make-ahead option for Thanksgiving. I haven’t tried freezing it, though, since cheesecake doesn’t generally freeze very well. 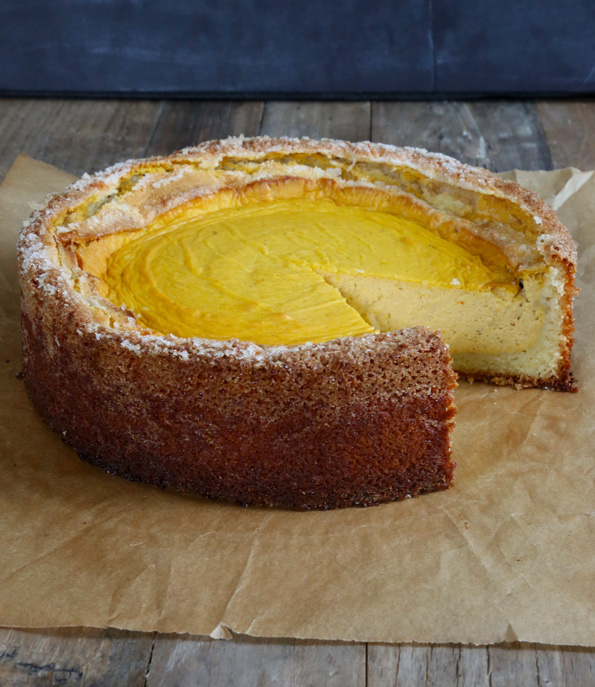 But just look at that velvety pumpkin cheesecake inside the gorgeous butter cake with that amazing sugar crust. This will be the Thanksgiving to remember. I can feel it! Preheat your oven to 375°F. Prepare a deep, 9-inch springform baking dish by greasing the bottom and sides generously with softened butter and sprinkling with an even layer of sugar. Tap the sugar around the pan to coat the entire buttered surface. Set the pans aside. Make the cake layer. In a large bowl, place the flour, cornstarch, baking powder, salt and sugar, and whisk to combine well. Create a well in the center of the dry ingredients and add the butter, eggs, vanilla and milk, mixing to combine after each addition. The batter should be thick but relatively fluffy. Scrape the batter into the prepared pan and spread it into an even layer. Set the pan aside. Make the pumpkin cheesecake layer. In the bowl of a stand mixer fitted with the paddle attachment or a large bowl with a hand mixer, place the cream cheese and beat on medium-high speed until light and fluffy. Add the pumpkin puree, eggs, vanilla, sugar, salt and pumpkin pie spice, beating to combine well after each addition. add the cornstarch, and beat to combine. The mixture should be light and fluffy. Scrape the cheesecake layer on top of the cake batter in the prepared pan, and spread into an even layer. Bake the cake. Place the pan on a large rimmed baking sheet lined with a piece of parchment paper. Place in the center of the preheated oven and bake until the cake is mostly set on top, with just a little bit of jiggle in the center when shaken lightly from side to side (about 45 minutes). Remove the pan from the oven, place on a wire rack and allow to cool completely in the pan. Unmold the cooled cake by removing the sides of the springform pan. Slice and serve. Adapted from my recipe for California Pizza Kitchen-Style Gluten Free Butter Cake, itself inspired by Homemade Cravings. P.S. If you don’t have your copy of Gluten Free on a Shoestring Bakes Bread yet, would you consider ordering one today? Your support means so much to me! Hi Nicole, I am planning to make the regular butter cake for thanksgiving(I.e nonpumpkin variety). The past recipe you posted seems to be suited for several small cakes, however I want to make a single large. Can I use this recipe and just omit the pumpkin? Hi, April, no, you can’t jus leave out the pumpkin! You can never just remove an ingredient from a recipe and get good results. I recommend that you use the CPK-Style Butter Cake recipe, and follow the baking directions from this one. Good luck! Just hit the 45-minute mark and like a couple of other commenters, have a completely undercooked cake that also looks NOTHING like the photos. Just a brown cake top. No pumpkin visible, whatsover. Thanks for nothing! Hi, recipe regrets, I’m sorry you didn’t have a good experience with this cake. I know it can be frustrating when a recipe doesn’t turn out as expected, but this is a very well-tested recipe, and is in fact just a version of another well-tested recipe on the site. If you made any substitutions, I’d always look there first, and I also can’t recommend baking by weight enough. If your flour blend isn’t one I recommend, that can have a significant effect on the end result as well. This cake is delicious. I made it exactly as described last night. But I think my oven is not as warm as it should be. I undercooked it. Next time I’d cook it for at least an additional 10 minutes if not longer. This happens to me quite a bit. Even undercooked a bit it tastes phenomenal! Sounds like you know exactly what happened, Moose Malibu. Thanks for your comment, and for keeping things so civil! Hello! Love this recipe! I made it today, but the top go very dark, very quickly. Any insight? It is still cooling so I haven’t tasted yet, but am perplexed at how dark the top is. Also, how do you incorporate the butter into the well in the step for the base, as the butter is still in solid form. Can I use a mixer for this step?? That sounds like a too-hot oven issue, which would cause the outside to bake faster, and even burn, gfinnh. You need an oven thermometer! You incorporate the butter into the dry ingredients by mixing because it is at room temperature, so it is soft. You can definitely use a mixer if you prefer, but be careful not to overwork the batter. thanks, Nicole, I will give it another try today! My oven thermometer fell over, so I will replace it in the center and give it another try! We devoured it yesterday, and when I cut into it ALL the cake was on the top and the pumpkin on the bottom. It was delicious despite the appearance. Hello, tried for a third time. I use my own flour blend, and it must be lighter than yours, so it climbs the sides and then covers the top completely! Any suggestions? Perhaps cut back on the corn starch? I’m afraid all flour blends are definitely not created equal. I really recommend you use one of my flour blends if you’d like to try again! If you make it ahead of time, how do you store it? Nevermind, I read above:) One other question, I ran out of gf flour. Can I use Betty Crocker yellow cake mix? I’d wait until you have flour, Cc! This is not a recipe designed to be made with a cake mix, no. This looks wonderful! Am I reading the recipe correctly about assembling the cake layer? : The cake batter is just a layer on the bottom, the cheesecake is then on top, and somehow the cake layer rises up and makes the crust on the sides? I trust you, Nicole, but how does it do it??? How does it know how to crawl up the sides?? It’s mind boggling to me! I’m good with the pudding cakes; makes total sense. But this is magic, I think. I am gf and dairy free. This looks so yummy. Do you think it could be made dairy free as well with maybe a dairy free cream cheese alternative? And would coconut milk or almond milk work? Thanks so much! I’d say take the plunge and go for it. Or, if you can have nuts, look on the web for pumpkin “cheesecakes” made with raw cashew cream. I have made a few different recipes, and they are delicious! Is canned pumpkin difference from pumpkin puree? Same thing, Diane. You just want to be sure it’s pure pumpkin, not pumpkin pie filling (with added ingredients). This looks amazing. And like even the non-GFers would enjoy it. Im going to attempt it with my larger springform for Thanksgiving. Hopefully it works!